Alampur near Kurnool is home to the very ancient Navabhramma temples dating back to the 7th century CE. Alampur is located at a distance of 200 km from Hyderabad. 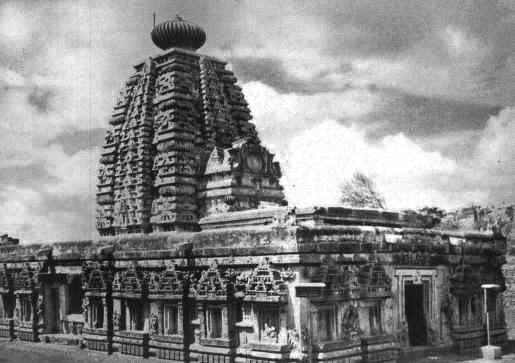 Alampur is considered to be the western gateway of Sree Sailam, the revered Jyotirlinga Shivastalam in Andhra Pradesh. The southern, eastern, and northern gateways are Siddhavattam, Tripurantakam and Umamaheswaram respectively. The Tungabhadra and Krishna are in confluence near Alampur, which is also known as Dakshina Kailasam (as is Sree Kalahasti in Southern Andhra Pradesh). Nine temples here referred to as the Nava Bhramma temples are dedicated to Shiva. The Nava Bhramma temples were built by the Badami Chalukyas, who ruled for about 200 years from the middle of the sixth century onwards. The Badami Chalukyas built several temples in Karnataka, and the Alampur temples in Andhra Pradesh.The Alampur site preserves archeological remains in the form of temples exhibiting a hybrid style of architecture - dating back to the 6th-7th centuries CE. Some of the images from this site are also housed in a museum nearby. The Nava Bhramma temples are Taraka Bhramma, Swarga Bhramma, Padma Bhramma, Bala Bhramma, Garuda Bhramma, Kumara Bhramma, Arka Bhramma, Vira Bhramma and the Vishwa Bhramma. These temples are all enclosed in a courtyard on the left bank of the river Tungabhadra. The Bala Bhramma temple is the principal shrine of worship. It dates back to the year 702 CE - per the inscriptions seen here. Shivaratri is celebrated in great splendour here. The Taraka Bhramma temple is partly in ruins, and it has no image in the sanctum. It bears telugu inscriptions from the 6th-7th century CE. The Swarga Bhramma temple with an imposing tower is considered to be among the finest in Alampur, and is an excellent specimen of Chalukyan architecture and sculpture. It contains several sculptures in bas relief, and it dates back to the end of the 8th century. The Padma Bhramma temple partly in ruins, contains a Shivalingam of clear stone with mirror like finish. The Viswa Bhramma temple is among the most artistic of the Nava Bhramma temples. The sculptural work here depicts scenes from the epics. Also in the enclosed courtyard is located the Suryanarayana temple, dating back to the 9th century. This temple has bas reliefs representing the incarnations of Vishnu. There is also a Narasimha temple with inscriptions from the period of Krishna Deva Raya of the Vijayanagar Empire. Near Alampur, is Papanasam with a cluster of over 20 temples of varying sizes and styles. The most important of these is the Papanaseswara temple.